You are here: Home » Chris Kelly » Will Venable be Worth It? Let me start by saying that I like Will Venable. A lot. I’ve met him and have read a good deal about him. There’s lots to like. Outside the clubhouse, Venable has many intangibles. He’s active in the community, generous, humble, intelligent, gracious. Just a good guy. On the field, there are also some skills he brings. Good frame, speed, defender, a decent bat (.252/.323/.415). 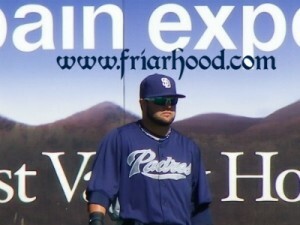 Is Jaff Decker a cost effective replacement for Venable? The fans have been given a standing narrative about Venable, and it generally goes something like: he came late to baseball (basketball kept him from focusing on it) but will blossom into a solid everyday player with the possibility of all-star potential. Well, Venable is officially 30+, and I think it’s safe to say that the waiting is over. Granted, in the larger context, the platoon of Denorfia and Venable has been a solid one for the Padres, dating back to last season. However, going forward, there are a few things to consider. First: is Venable fulfilling his lefty role in that platoon? Second (really 1A): is the salary justified? The two issues are related, so let’s look at them in unison. Venable is making $2.7M this season, up from $1.5M last season. That accounts for 3.80% of the team’s salary. As it stands, his total WAR for 2013 is 0.4. Clearly, we’re not getting the proverbial bang for the buck here. Additionally, his value at the plate should be in his lefty swing. So far, he’s hitting .237/.311/.419 against righties, down about 30 points all around from last season. Now, Venable is a player who typically performs better in the second half (.324 and .279 in Aug and Sept last season), so he’ll likely finish the season at or near his career line. Given the state of arbitration (Venable is eligible next season), his salary will likely remain the same or even increase. The question I have for you is, would you like that $2-3M to go to Venable, or would you prefer it go to a different player…perhaps part of a long-term contract to Chase Headley, for example? Before you answer that, let me give you some of the replacement options. And note, they’ll all be considerably cheaper. Option #1: Jaff Decker. LHB. Decker has spent six seasons in the Padres’ system, owning a career MiLB line of: .263/.403/.455. Currently, he’s hitting .254/.367/.403 in AAA Tucson. Decker has some pop in his bat and has a good eye. Against RHP, Decker is hitting .269/.365/.429. Despite his build (5’10” 190lbs), he is a good defender with a strong arm. Decker would be making his MLB debut, so the salary will be a fraction of the cost of Venable. Conclusion: Decker would be a downgrade on the basepaths and a slight downgrade with the bat and the glove, but he might be justifiable in the overall cost analysis. Option #2: Travis Buck, LHB. Buck has seen parts of six seasons of pro ball, possessing a line of: .243/.316/.399. He’s hitting .275/.321/.480 in Tucson this season. Against right handers, Buck is hitting: .282/.333/.494. He’s not a strong defender in the outfield, as his frame (6’2″ 230lbs) limits his range and speed. (As an FYI, if he’s not on the major league roster by June 15, he can opt out of his deal.) Last season, with the Astros, Buck made $580K. Conclusion: Buck would be a substantial downgrade on the field and the bases, but the bat might be a slight upgrade. Given the salary, this move doesn’t seem to make sense. BEST OPTION: Daniel Robertson, RHB. Robertson has done nothing but hit in his six minor league seasons. Overall, his career line is: .307/.384/.415. This season, Robertson is hitting an impressive .313/.395/.442. Another ‘despite the frame’ guy, Robertson’s size (5’8″ 175lbs) doesn’t prevent him from being a strong defender, capable of making the big play. He’s quick to the ball and takes good routes. Even more impressively, Robertson is hitting .336/.404/.482 against right handed pitching. Robertson, much like Decker, would be making his big league debut. Conclusion: Robertson could likely be an upgrade with the bat, a wash on the bases, and an only a slight downgrade (if at all) in the field. Robertson, like Decker, would be making his debut, so the salary would be significantly less. This move would make sense. The ultimate conclusion seems to be that Venable’s production could be replaced at a fraction of the cost. The team could likely find a match through trade, freeing up the money to go in any number of directions: Headley’s deal, a starting pitcher, Everth Cabrera‘s arbitration, etc. The other factor to consider here, as well, is the return of Cameron Maybin. Let him go. We’ve wasted too much time on him already. His speed is his only asset. His bat is below average and he consistently breaks the wrong way on balls hit his way. Any rookie can fill his spot with greater upside potential. See ya! Great work Chris. Few things I’d like to add. Venable will get a bump in salary next year and it will be in the $3-4MM range. I do think the Padres envision Liriano as the answer in RF (I’m not sold on that personally). But Decker, and Robertson could be options in 2013 and 2014. His swing mechanics have looked a little long to me. Hitting coaches are making a big difference lately. You want him in the lineup when he finds a zone (albeit it has taken too long) because I believe this could be the season. Hitting in the minors historically doesn’t equate to hitting in the majors. Yes, it’s a guideline.. but by no means a guarantee. Neither of the candidates is ready to oust Venable, no upgrades in this bunch, better keep Venable for another couple of seasons. Rafael…true…no upgrades on the field, but there’s a cost analysis effect here. If you get fairly similar production at a much lower cost (allowing you to spend elsewhere), then it’s an upgrade, isn’t it? Granted…there’s no guarantee any of these candidates would perform, but on the other hand there’s also the chance one could blossom. The beauty of the bigs! I understand your point and it’s a valid one, but I take exception to the overall premise. I really don’t think Venable’s salary is that exorbitant. I know we’re not Yankees, but for chrissake the Padres should be able to afford this “luxury” for 2014 especially if other pieces are in place.